Do you want to read the original New Testament? 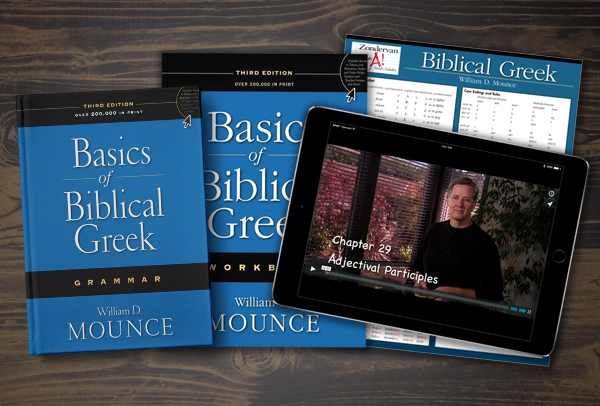 If your goal is to learn to read the Greek Testament, then have we got the resources for you! Books. Videos. Online course. Lots of free stuff. 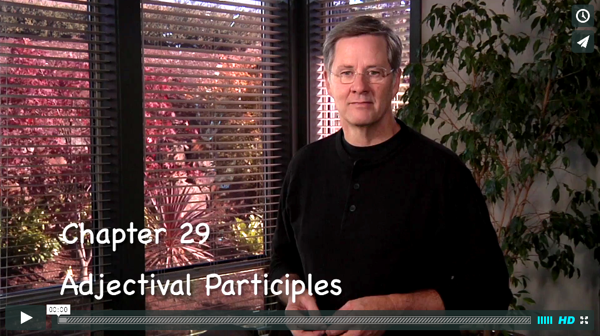 A full two semester Greek class in video that includes Bill discussing every chapter in his grammar. Chapter overviews (formerly called, "Summary lectures") that can be listened to online or download to your iPod, including study guides. Keynote presentations fo the workbook for display in class. Answers to the exercises in the workbook are available in several formats. Download the answers as a PDF document. 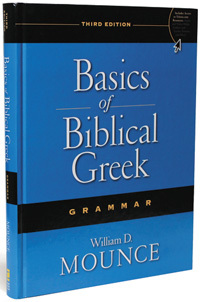 Helps and answers are also available in context in our online Greek course. Here are some other goodies to help you learn Greek, and perhaps to even make it a little fun. Paradigms to help you learn Greek (Word or pdf). You can download a pdf of all the vocabulary words in the vocabulary card product. The first 319 are listed in order of appearance in Basics of Biblcal Greek, and the rest are in alphabetical order. This list is not included in the Vocabulary Cards product. Biblical Greek Survival Kit. You can purchase the vocabulary cards, audio CD, and laminated summary sheet in one package. Biblical Greek Laminated Sheet. A four page summary of the basic information you need to know. Basics of Biblical Greek Vocabulary Cards. Cards containing the 1000 words occurring 10 times or more in the New Testament. Biblical Greek: A Compact Guide. This little book summarizes all the basic information you need to translate Greek. A great traveling companion. A Graded Reader of Biblical Greek. This resource helps you read through larger passages of the Greek Testament. The Morphology of Biblical Greek. This book shows you every paradigm you will ever want to see, and then tells you why the Greek forms are what they are. The Analytical Lexicon to the Greek New Testament. Parses every word in the Greek New Testament.